The Saskatchewan Food Industry Development Centre Inc. (Food Centre) provides expertise and resources to assist agri-businesses in bringing food innovations to commercialization. 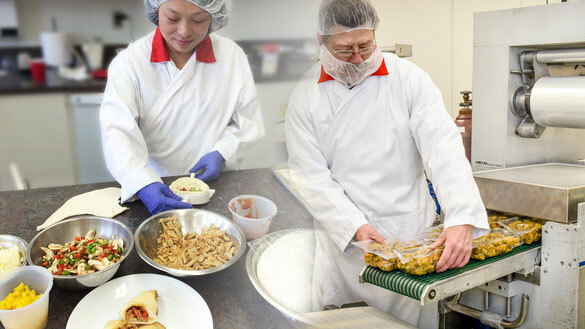 Our expertise include unique food and process development, interim processing and incubation, pulse innovation, extrusion, food safety training, and path-finding. The Food Centre has established a reputable role in food industry for R&D of new food concepts. Working with world-class agencies in Saskatchewan and around the world, we specialize in novel ingredient development and applications. Our specialty include working with dairy, fruits, confectionery and various crops such as pulses and cereals. Since inception, the Food Centre has developed and processed over 800 products for clients, with an estimated 50% introduced into the market. The Food Centre’s two processing facilities are equipped with innovative technologies to manufacture a variety of food products. Our numerous certifications such as: HACCP Approved, Canadian Food Inspection Agency (CFIA) approved for meat, dairy and processed foods, FDA approved for processed foods, HALAL, Organic, and NHP licensed enable our clients to access new market and export opportunities. The Food Centre recently expanded with construction of the new Agri-Food Innovation Centre. This 38,000 square feet of space will house the Food Centre and a collection of resources to drive commercialization of new and innovative value-added products derived from Saskatchewan’s agricultural inputs.